It's a sign of how far the British cheese renaissance has come that cheeses that had once died out are being resurrected by new producers. Farmhouse Red Leicester, Staffordshire cheese and Dovedale Blue have all been revived in recent years after going missing from Britain's larder. Most recently, Matthew O'Callaghan food historian and chairman of the Melton Mowbray Pork Pie Association has helped reestablish Colwick cheese in Nottinghamshire. Colwick is a light, fresh cow's milk cheese, which was produced throughout Nottinghamshire from the mid 1600s. The last commercial production stopped in 1993, but O'Callaghan rediscovered a recipe for the cheese several years ago and encouraged Leicestershire dairy farmers Alan and Jane Hewson to start making it once again. The couple have since set up their own creamery - Belvoir Ridge - at Crossroads Farm, using pasteurised milk from their own 60-strong herd of Red Poll cows to make Colwick. 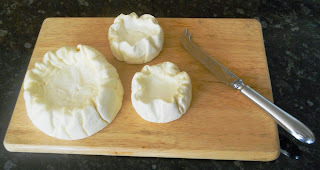 The cheese has a lactic flavour with a curdy tang and a distinctive bowl shape, which can be topped with fresh fruit. It was officially launched at the Artisan Cheese Fair in Melton Mowbray earlier this year and is due to feature in an upcoming episode of the second series of Jamie and Jimmy's Food Fight Club. It's also been admitted into Slow Food's Ark of Taste. 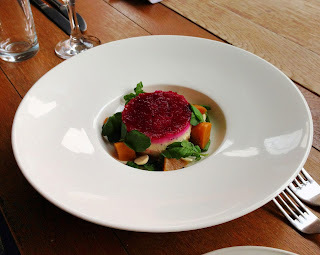 There's a fine looking recipe for grilled peach salad with Parma ham and Colwick on Jamie's website and local pub the Larder on Goosegate (which featured in the programme) is serving it with honey-roasted Roscoff onions, squash and hazelnuts and also makes kind of beetroot cheesecake with it (pictured above).